white and blue are more than the colors of her native country’s flag. White is her memory of the sun-kissed stucco school building she attended from grade one to grade six. Blue is the color of the beautiful water around the island of Kalymnos where she lived as a child. Kalymnos is an island of the Dodecanese in the southeastern Aegean Sea, close to the coast of western Turkey. Alexandra explains that Kalymnos lies about an hour by air from Athens. She and her family – her mother, father, five sisters and brothers – moved there after her Kindergarten year in the Greek capital. “The bakery that my father owned – Fagas Bakery – is still there,” Alexandra says with a smile. It’s been about two years since her last visit to Greece, but Alexandra’s recollection of her elementary school years is immediate and vivid. 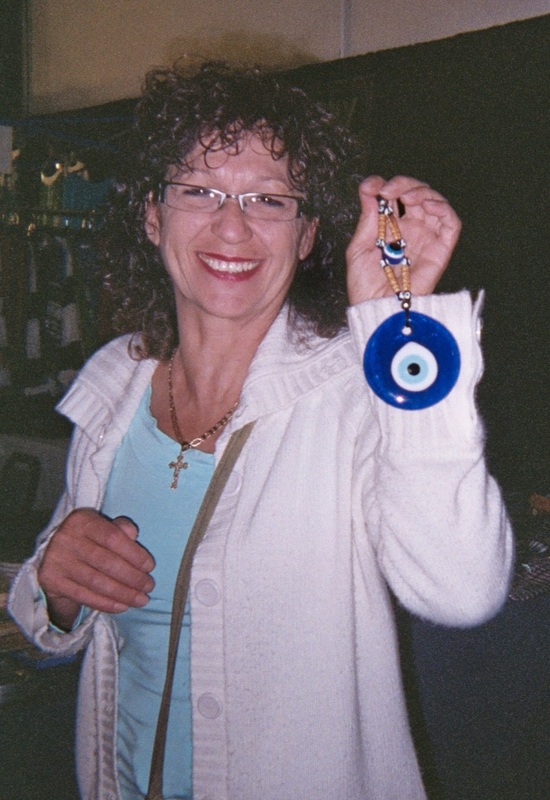 People of Greece and other cultures believe that the blue eye will protect them from evil. Could Alexandra’s and her peers’ behavior in school have been influenced by a belief that the evil eye was watching them for any missteps; that they needed to wear a blue eye, like the one in my blog pic here, for good luck? Alexandra’s recount of her elementary school years included no mention of that. 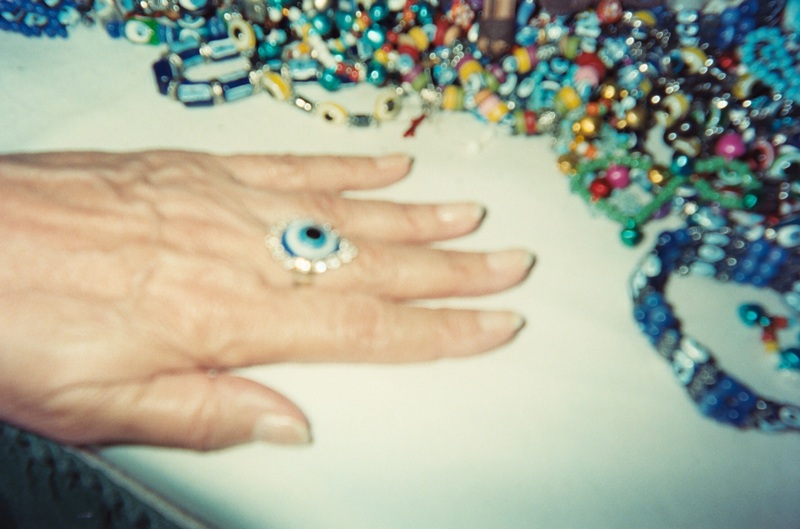 I only share the thought because of the popularity of nazars (Greek word for charms), like the blue eye that Alexandra displays in her collection of Greek jewelry and crafts. As in any part of the world, excellence is respected…and rewarded. Alexandra proudly says that her school was the best in gymnastics. “I won six trophies in sixth grade!” she remembers. International festivals offer teachers, like us – we can search for festivals to access in person, online or host our own – opportunities to learn about different customs and cultures. Alexandra enjoys sharing the legend of the blue eye, like you see her doing in my blog pic below. Classroom Festival Fun – Host an International Festival of Good Luck for your class (or grade level; you might collaborate on this activity with other teachers). 1. Do research to discover a popular good luck charm in a country you assign based on your Social Studies curriculum (or one each student selects) to study. 2. Write down the name of the charm and a summary of its history and meaning. 3. Copy or draw the basic shape of the charm on light-colored construction paper. Color according to research. Cut out shape. Glue shape to a small poster board of a contrasting color. 4. Write the name of each charm on the poster board in the language of the country of origin and in your language. 5. Present the good luck charms to an audience, telling the country of origin and summary information about each one. Create a Good Luck Bulletin Board – easy as 1 – 2 -3! 1. Make and post a bulletin board sign that reads Good Luck Around the World! 2. Post a world globe at the center of the bulletin board. 3. Arrange the small poster boards with the good luck charms around the globe. Ask your students if they believe in good luck. Allow volunteers to say aloud what they wear or carry for good luck. Again, depending on your grade level, discuss why people feel better when they own good luck charms even if they really believe that charms cannot protect them. Believe this…hosting an International Festival of Good Luck can add magic to learning about the world! Remember, you don’t need to be a magician to add magic to any instructional settings! Talk with you next Monday – Attentionology for K – 5 Teachers. 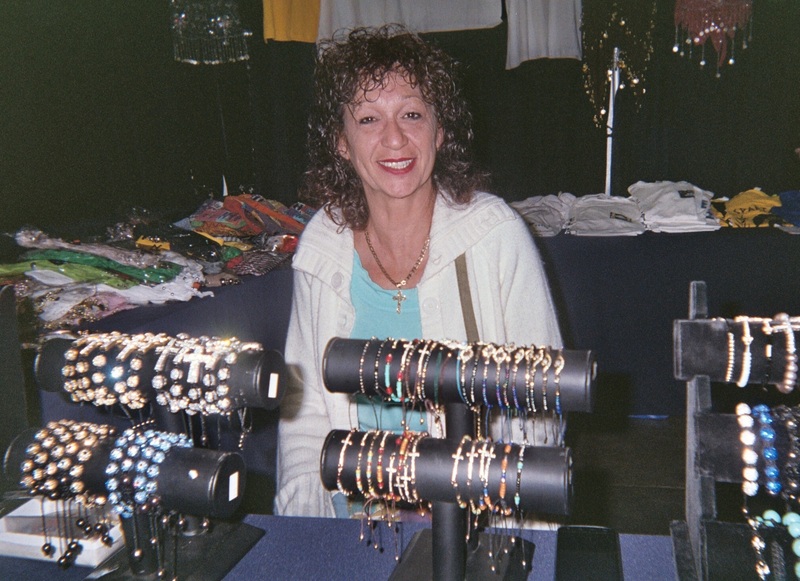 We bought a necklace for my daughter from Alexandra at the Greek Festival in Raleigh, NC, on Sept.16. I would like to buy earrings to go with it. How can I contact her? Evidently she doesn’t have a website.